If you follow me on Facebook, I'm sure you have seen all the Pure Ice polishes I have been picking up lately! I am a little obsessed with checking the displays every time I make a run to Walmart and picking up one or two! ;) I've been really impressed with the colors popping up lately and they are so cheap, it's easy to pick up 1 or 10! :P I fell in love with Sugar Cookie when I first saw it and even though I planned to swatch different Pure Ice polishes today, I went with these 3 instead. Pure Ice Five-Some is a black based polish with multiple colors of micro glitter. All nails are 3 coats with a top coat of Seche Vite. Sugar has a clear base with iridescent hex glitters and slightly larger red hex glitters. I started with 2 coats of Pure Ice Party Hard (I tried to get photos of this polish alone but my camera was not having it) and added 2 coats of Sugar Cookie and no top coat. 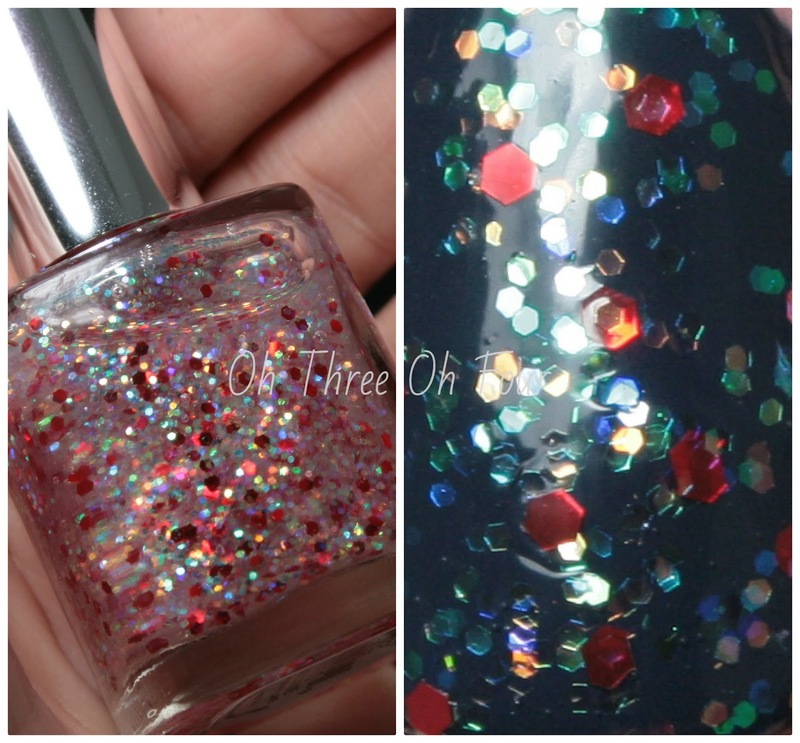 An awesome reader on Facebook pointed out to me that this color appears to be a perfect dupe for Julep O Canada! The formula was excellent and pretty shiny with no top coat. I love this color and while I can't say if it a perfect dupe for O Canada! or not, for the price you can't beat it! 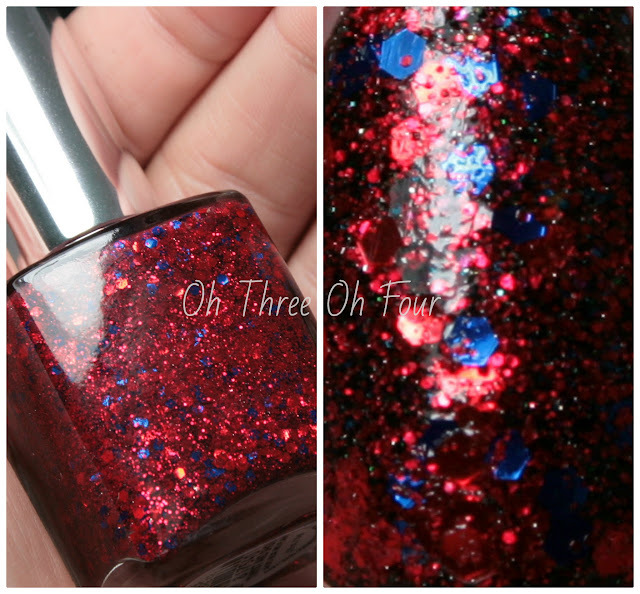 Twist and Shout is micro red glitter and medium sized blue and red hex glitter in a clear base. All nails are 2 coats over Pure Ice Five-Some with a top coat of Seche Vite. Pure Ice polishes are available at Walmart in store and online through Bari Cosmetics here. They generally run around $1.97, so you really can't beat the price. I'm not sure if any of these polishes are limited edition or not, I found all of them in new the Pure Ice displays at my local Walmart. I'm assuming Sugar Cookie is apart of a holiday collection, as I found it with other polishes that had holiday themed names. Find Pure Ice on Facebook here.